Adriana is certified to teach Zumba Basic, Gold, Toning, Step, Cirucuit and Kids. Adriana teaches Zumba Gold Fridays 10:30-11:30AM and Family Zumba on Saturdays 10:30-11:30AM. Ana Palencia loves to teach Zumba classes. The reason is simple. for her, every class feels like a party! Ana is certified to teach Zumba Basic and Zumba Step. Ana teaches bilingual (English/Spanish) Zumba Basic Mondays 5:00-6:00PM. Catherine McConkie is a Natural Chef instructor at Bauman College Berkeley, teaching both foundational and therapeutic cooking classes. She is core faculty for the Healing Kitchens Institute and co–founder of Cooks on Call; a program dedicated to training chefs about ways cooking not only supports wellness but about how it can tickle the taste buds of those undergoing health challenges. Catherine is on staff for the Center for Mind Body Medicine’s Food as Medicine conference and for Healing Journeys’ Cancer Fighting Kitchen workshops. In 2010 Catherine collaborated with UCSF’s Palliative Care Team’s as retreat chef and has worked as the retreat caterer for Dr. Dean Ornish. In 2001 Catherine graduated from the Natural Gourmet Institute for Health and Culinary Arts in New York City. She is a graduate of Bauman College’s Nutrition Consultant Training program in 1999. 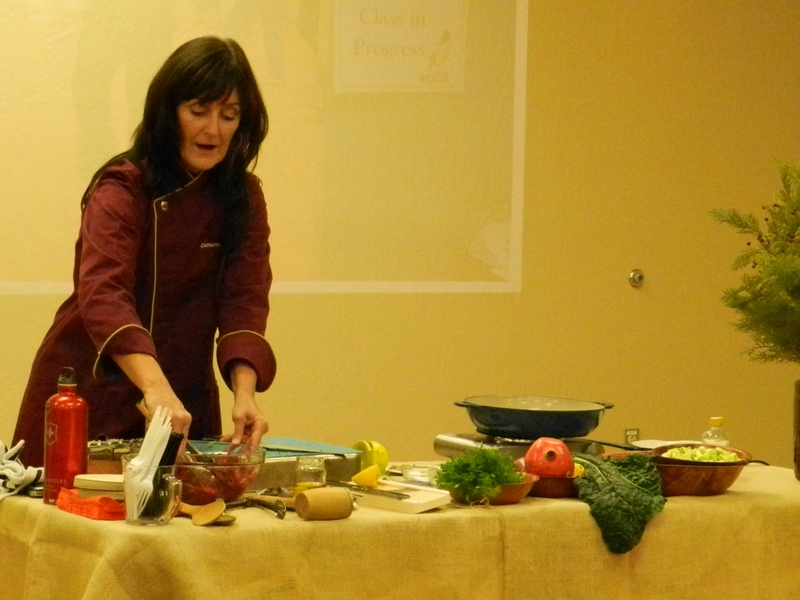 Catherine leads Cooking Demos the fourth Thursday of each month noon to 1:00PM. Cynthia loves to share the healing power of yoga, fitness and wellness wherever she goes. Her classes are uplifting, fun, safe and custom tailored for all to enjoy. Cynthia discovered yoga, fitness and holistic healing in 1987 due to major injuries, immobility and pain in her body. Being a lover of freedom, motion, and the idea that life is a journey and adventure, she dove into every option for healing. There began her entry to a lifelong journey of wellness, a gateway through which she discovered what she loves. Later, in 1997, Cynthia became a personal trainer and private yoga instructor. When she moved to San Francisco in 2004, she founded The Radiant Heart providing yoga, meditation, nutrition, holistic life training and Life Purpose coaching. Currently, she teaches throughout the Bay area. Her classes include Chair yoga, Chair fitness, public and private yoga. She also offers her own creation of Mutisensory Yoga to communities such as the disabled, autistic, elderly, caregivers, cancer patients, and others to accelerate healing and wellbeing. She is certified with The National Academy of Sports Medicine (NASM) with many yoga certifications including Yoga Works and It’s Yoga in San Francisco. Cynthia teaches Chair, Stretch and Boogie Wednesdays 3:30-4:30PM. Hassan developed a passion for human movement and sport psychology early during his college years. Hassan student Kinesiology at San Francisco State University which provided him with a comprehensive background of movement sciences and all it’s sub-fields. Currently Hassan is a personal trainer and group instructor at various locations around San Francisco. Jasmine Douville has been teaching dance in the Bay Area for over 10 years at the African American Art and Culture Complex, SFSU, USF and other notable institutions. Jasmine got her MFA in dance and choreography from Mills College in Oakland, California and she is the Director of School Based Services for the Boys and Girls Club in San Francisco. Her choreographic work has been featured at Dance Mission, AAACC, the YBCA just to name a few. Jasmine is also the company founder and choreographer of Diversity In Motion, a dance company based around movement and education. It’s goal is to not only to entertain, but educate its members and the audience who partake in the shows. Jasmine teaches Hip Hop Tuesdays 1:00-2:00PM. Joti Singh teaches Bhangra dance all over the San Francisco Bay Area. She also teaches, studies, and performs West African dance from Guinea. Joti has traveled to Guinea several times to study with Master Dancer Moustapha Bangoura and other members of Les Ballets Africains. She has performed throughout the Bay Area, including at UC Berkeley’s Zellerbach Hall and on ABC TV’s program “View from the Bay.” Joti has participated in the Alliance for California Traditional Arts’ (ACTA) Apprenticeship program with Alseny Soumah and recently received a grant from the organization to study with Youssouf Koumbassa. Joti founded Duniya Dance Company in April 2007. She was also an Artist in Residence at CounterPULSE during the summer of 2008 culminating in the show Dhoom Dhamaka! She holds an M.A. in South Asian Studies from UC Berkeley. Joti teaches Bollywood Dance Fridays 12:00-1:00PM. Originally from Barcelona, Yogimani is a yoga instructor that serves diverse communities through yoga events in San Francisco and abroad. As a kid, Yogimani took martial arts, dancing classes, and developed a great appreciation for nature. As a teenager, she traveled internationally, discovered yoga, and kept it constant. In1995, she graduated with a degree in hospitality & tours management, and worked throughout Europe in hospitality, airlines, and as a tour leader. In 1999, she moved to San Francisco to continue the yoga practice and study business administration, graduating in 2002. Then, she worked in human resources, technology, and finances while keeping a consistent yoga and meditation practice. In 2011, Yogimani decided to combine her professional background with yoga and became a Registered Yoga Teacher (RYT 200). Since then, she has continued studying and sharing the yoga practice with the community in San Francisco and abroad. Yogimani has been formally trained in such a variety of yoga styles and has worn so many different professional hats that her capacity to adjust to new places, cultures, and circumstances will leave you in awe. Yogimani teaches bilingual (English/Spanish) Yoga Wednesdays at 2:30PM. This class consists of a well-rounded session with emphasis on breathing, foundation, and alignment, using the ground, props, and the wall to perform the physical postures. The sequences are designed to increase strength, balance, flexibility, and to leave practitioners feeling calm, happy and free. Ryan Mead is a co-director and co-founder of Rueda Con Ritmo, a Cuban-style dance school and performing group based in the San Francisco Bay Area. With more than five years’ experience teaching Cuban and Miami-style salsa, Ryan has given workshops across the country, from Atlanta to Alaska, and internationally in Mexico, Canada, and New Zealand. Ryan also has nearly two decades of experience as a percussionist – he is an alumnus of the New England Conservatory, and has taken several trips to Cuba to study music (most recently on a grant from Stanford). 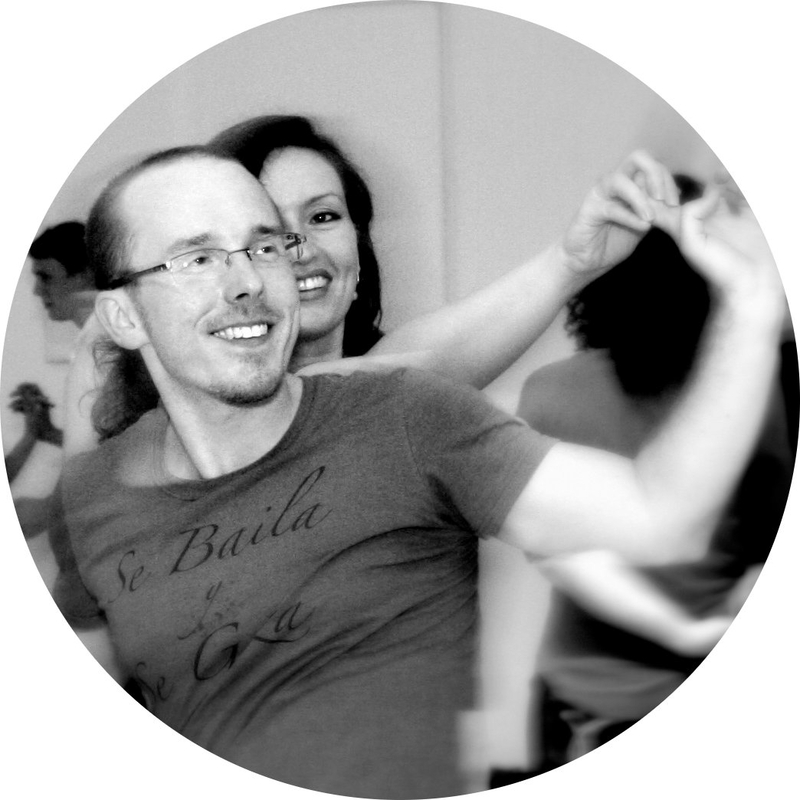 Ryan teaches bilingual (English/Spanish) Salsa Wednesdays 5:00-6:00PM.